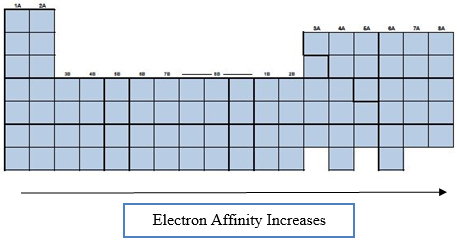 Electron Affinity is the amount of energy required for an atom to attain an electron (in kJ/mol) of an atom in its gaseous state. EA is a measured value determined in units of kJ/mol like ionization energy. Why? Right-most elements are nonmetals and like to gain electrons, hence they have an affinity for electrons or ↑ EA. Left-most elements are metals who have no desire to keep electrons, thus: ↓ EA.